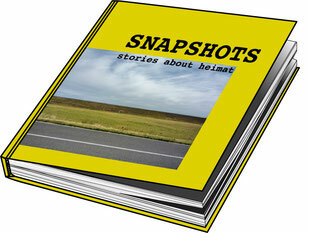 SNAPSHOTS stories about heimat” is a book about places and people who live there. A book about people, who are telling stories from their homeland. A book full of stories, anecdotes, snapshots and portraits. We will be collecting stories during our one-year bike trip through North America. We will be meeting the narrators by accident, spontaneously. At places where they live, work, places they call homeland. We want to hear their stories, why they stayed there, came back, or why they want to leave. What binds them with that particular place. We are here today, tomorrow already there. Each encounter is a moment in time, a snapshot. No tourist guide, no history book tells us more about the people and the country. “SNAPSHOTS stories about heimat” is no travelogue. In fact it is a mosaic made of various encounters, moments and soundtracks collected along the way. An assemblage of stories put together into saturated narration. Storytelling is a key element of our project. During our past travels we have learned that people, often spontaneously, have been telling us stories and in that poetic manner we have been able to find a lot about places we have had visited. For us a particular charm of storytelling is that every story is personal and subjective. It does not matter if what is being told is factual, exaggerated, politically or historically correct. We simply want to listen and to relay it in our book. The Storytelling will be happening spontaneously. We will just create a space for the narration, perhaps an offer of a simple meal and invitation to the table. We will sit together and wait for what will be told. For the project we will make use of our skills. Natalie, a cultural scientist, who is into writing, will be collecting stories. Piotr, an architect and photographer will be making portraits, landscapes and snapshots, as the case may be. What will be heard and seen is to be processed into concise profiles made of text and image in form of a book. The goal of our project is a high quality, nonfiction book. It is oriented towards anyone who likes albums, is afflicted with wanderlust, or the opposite: homesickness. Who is interested in the literature about Canada and North America. Or simply has preference for travel literature. The first and the most time-consuming step towards the book is formulation of the content: writing texts, photographing and photo editing. The next step (at the end of our journey, around December 2014) is to develop a draft version of the book in collaboration with an editor. After that comes the copy-editing and translations, if need be. During the project runtime (until February 2015) we will be looking for a suitable publisher. It is considered optionally to issue the book independently by book-on-demand service. Financing through the website 100-days.net is meant to cover the expenses of the elaboration and compilation of the content. This includes the processing and digitalisation of the stories, selecting and editing the photographs, designing the layout of the book, copy-editing, translations and communication with editorial offices. The target cost of 3500 Swiss Francs will cover the expenses of our work on the content (workplace, internet, gear), cooperation with specialists (graphic design, layout, translation, communication) and the test print.